On Thursday 21st of March Primary 3 held our Family Learning event. We invited parents/carers into our classrooms to see our learning as part of our ‘Powering Our Planet’ context. 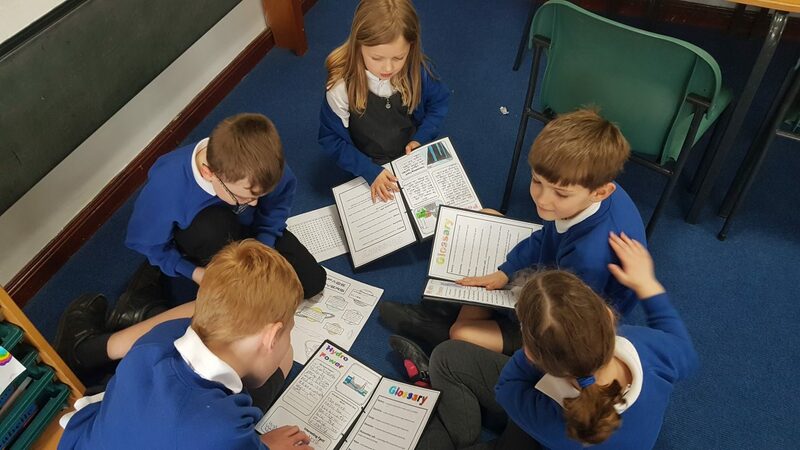 Pupils had the chance to share their non-fiction books they had written over the course of the term, explore the snap n’fix electricity games and create simple circuits. On Friday 29th March we shared our books again with Primary 6. In turn, they shared their space buggies which they have been designing. Primary 6 took making circuits to the next level by adding motors to turn their buggies wheels! We even witnessed a buggy race in the hall! On Wednesday 16th January we went on a really looooong journey…all the way to Antarctica! Our tour guides for the trip were Mr and Mrs McCreath who were entertaining, informative and lots of fun. Our journey started with a song played beautifully on the piano by Mrs McCreath – we joined in singing about p-p-p- penguins. We were then introduced to their cuddly penguin who sleeps in Mr and Mrs McCreath’s bed…we thought he might’ve been better sleeping in the fridge or freezer but Mrs McCreath said he quite likes sleeping in the bed. He must be acclimatising! Next up, our expert tour guide Mr McCreath who has recently returned from a 10 day tour of Antarctica shared his experiences and knowledge with us. He went on a boat (more modern than Captain Scott’s) then chose to kayak as part of his tour – we watched videos of him kayaking through the ice and heard it crunching as he paddled. We all loved seeing the photographs of the animals and there were lots of ‘awwwwww’ moments. The penguins were very funny – playing football, tig, sunbathing and even….kissing! We got to pretend to be penguins huddled together in a colony to keep us warm; the penguins at the front then had to waddle to the back when they got too cold. Mr McCreath used 3 of us with our arms outstretched to show us the wingspan of an albatross – it was 3 metres!! We learned that an albatross can stay in the air for about a year without touching the ground – it even sleeps in the air. Our journey came to an end as we got back on the boat and waved goodbye to the penguins. Harris M – I thought it was really funny when you told us about the penguins going along their tracks and they kept changing direction and forgetting where they were going. Helena – I learned that penguins like to steal stones from each other’s nests and I thought it was really funny. Eva R – I learned that it took Mr McCreath 4 and a half days to get to Antarctica. It sounds like a really long journey – I really want to go there one day. Johnny – I really liked the p-p-p-penguin song because it had some facts in it too. Emma R – I liked seeing the cuddly toy penguin from Antarctica. Luke – It was funny seeing the baby wind up penguin hatching out of the egg. Finally, we would just like to say a massive thank you to Mr and Mrs McCreath – what a wonderful afternoon for the children and teachers! Primary 3 visit Dunblane Library! Today, Primary 3 went on a trip to Dunblane Library. We met Angela who welcomed us and got us started with a story called ‘Poles Apart’. Everybody knows that penguins belong at the South Pole and polar bears live at the North Pole – but in this story a family of penguins got lost, and found themselves at the wrong pole! They needed the polar bear to help guide them home. We had to use our knowledge of the Arctic and the Antarctic to decide which animals lived in the North or South Pole. We already knew where some of the animals lived but we learned some new ones too. Angela had looked out a selection of fiction and non-fiction books linked to our context ‘Poles Apart’. We had some time to explore the different books and choose which ones we wanted to bring back to school. We finished our library session with a story about an explorer. We had a super time and learned lots from Angela about the library. On Thursday 4th October, both P3 classes led the assembly. We had been learning about unity and how important it is to work together. We told the story of ‘The Enormous Turnip’ through drama. Our four fabulous narrators, Eva M, Harris K, Rachel and Ruaridh spoke clearly and fluently to tell the story. Our showstopper was singing and dancing to ‘We’re All in This Together’ from High School Musical which highlighted our theme of unity. Our dancers were very committed and voluntarily spent their lunchtimes learning the dance routines and they were brilliant on the day! We would like to thank Pamela (Rubber Chicken Theatre) for lending us some props, face painting our actors and glittering our dancers. Mrs Aitken and Miss McDonald are very proud of our P3 stars! We have all had a brilliant summer holiday and are enjoying being back at school with all of our friends. Next, we used watercolour paints to create our own medicine bottle. Leah, Orlaith, Rachel, Farah, Fraser S, Jack, Findlay and Yasmin loved mixing the colours together. We then thought of a name for our medicines and wrote a label to explain what the medicine was for. We have also written our own tweets as if we were Grandma telling everyone what happened the day she tried George’s medicine. We are learning how to use a dictionary in class and have created our own ‘George’s Marvellous Dictionary’. We found the definitions of words from the story and added these to our own dictionary. We can’t wait to read the rest of the story and find out what happens next. Please follow the link below for P.3 Meet the Teacher information leaflet. Yesterday, P2M went out into Dunblane to learn more for our context, Dunblane Detectives. First we went to the Cathedral. We looked for a dragon carving, gravestones inside the cathedral and animal carvings too. Next we went to the Leighton Library. We found out that the librarian lived in a dark, cold room underneath the library. We found out that all of the books were brought in a boat from England. Next we went to the Laighills Park. We all had our lunch then we played at the park. After the park, we visited Dunblane Museum. We learned that people would have used a big crane to pick up heavy stones that they used to build the Cathedral. We got to try on some Scottish clothing. We saw lots of pictures of when the Cathedral had no roof. We also went into the museum garden and looked into the deep well. We had a great day learning more about our town and enjoyed our picnic lunch in the sunshine. Thank you to all of the parents who helped out. To kick off National Digital Learning week, P2M have been using various digital technologies to support their Maths and Numeracy work on position and movement. The children have enjoyed programming BeeBots and using the BeeBot app to give directions. On Friday 27th April, we went on our school trip to Almond Valley. Thank you to all of the parents who came along to support the trip. This term, P2M have been learning about measurement in Maths and Numeracy. We have been learning to measure length and height using non-standard units and recently using metres. We have linked lots of our learning to our Jurassic Jungle context. On Tuesday 27th March, we invited our parents and carers in to class so that we could share our learning with them. We were the teachers for our visitors and showed them what and how we have been learning about measurement. We really enjoyed being teachers for our visitors. Our visitors gave us some feedback. Thank you parents and carers for coming to join in with our learning. We are now looking forward to the Easter holidays.